First grade math activities are a great way of making numbers easy and fun - just like they should be! One way of making sure your child stays on top of 1st Grade maths is to keep maths real and base it on your child's favorite activities. The idea behind all successful First Grade maths is to build maths into all your child's favorite activities. So what's the drawing of the dog doing here? The answer is that dogs were my daughter Catherine's favorite animal at 1st Grade in homeschool. So we used them for homeschooling fun math for kids! Here are lots of suggestions for fun math activities. 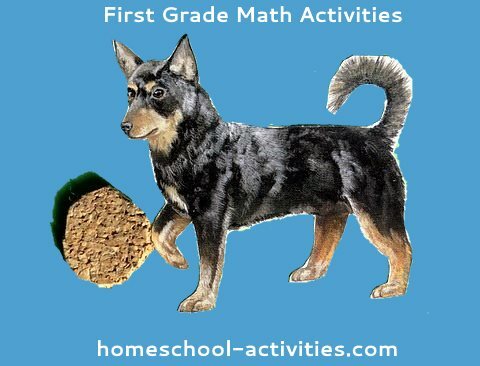 Homeschool Maths - With Dogs! Get a dog fact file. Look up facts and figures - size, weight, tail length... It's a great way of covering all different ways of measuring to help homeschooling number comparisons. Go to the local park and do a survey of how many dogs of each breed you can see. Get your child to write down the numbers of Labradors / Spaniels / etc. The fun part is that you often can't tell! So that means asking the owners. Which makes this one of those very social homeschool 1st Grade math activities for kids! Use the numbers to help First Grade math activities by getting your child make a simple homeschool bar chart showing which is the most popular pet. First Grade is the age when your child really begins to get to grips with making models. There is so much maths to be learnt - numbers, stages, logic - that kids' homeschool models might as well be a maths teacher's heaven. Lego models have to come 1st as the brand leader for kids. So many inventive and fun ones to choose. Use the chance to get your child adding up blocks, counting knobs and sorting shapes. 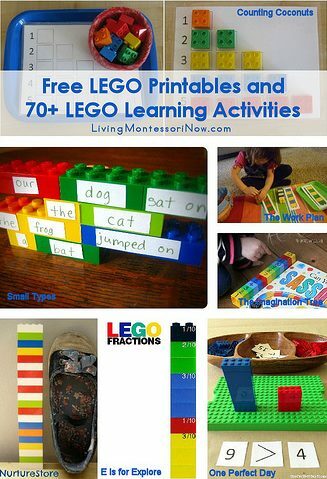 You can get some great free lego printables from Living Montessori Now.com. K'Nex. Well worth trying out. My son William loved his K'Nex and learnt so much homeschool maths while doing them. His K'nex fairground ride took up the top half of the garden! 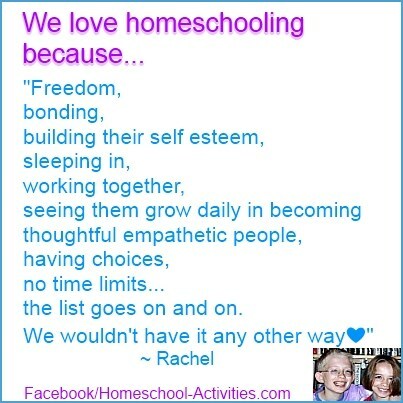 Make your own homeschool model. This is more challenging for 1st Grade kids, but infinitely rewarding. 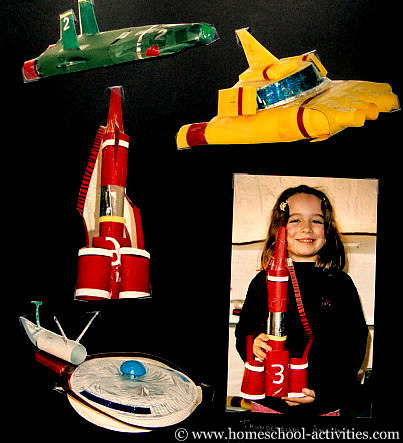 Here's Catherine with her Thunderbird models. I'll explain how to make them in our homeschooling craft activities, but if you look closely, you'll see they are essentially cardboard boxes of different shapes and sizes covered in colored card. Teaches measurement, shapes and dimensions - but, above all, that homeschooling maths is fun! The power of food can't be underestimated with First Grade kids! Get your child cooking treats for homeschool. Toffee marshmallow crispies, raspberry pavlova - whatever it takes to get your child using those weighing scales. There are lots more maths activities for 1st Grade in our page on homeschool kindergarten math. You can see homeschooling board, card and dice games, including UNO and Monopoly, as well as playing shop with a cash till. They can all be enjoyed by your child well into 1st grade. Kids counting games in preschool math. Kids fun preschool math activity. Make a homeschool butterfly and learn maths at the same time! Second Grade Math. Top Trumps are great for fun math activities to use for homeschooling and William and Catherine were certainly playing them by 1st Grade; why not make your own? Fun Third Grade Math Activities For Kids. Our favorite homeschooling board games. First grade math activities build numbers into whatever your child enjoys most - and that makes numbers easy and fun.